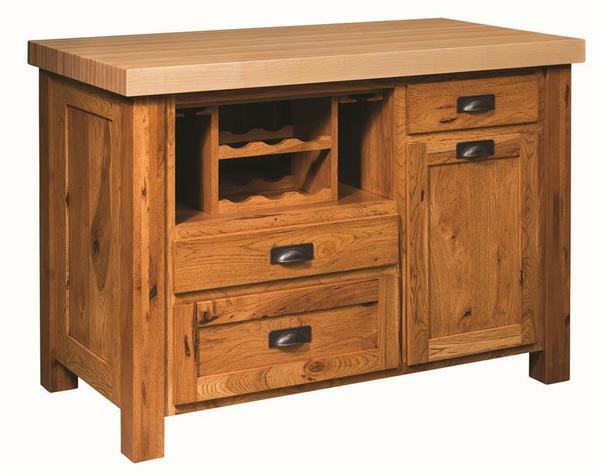 This Amish Classic Mission Kitchen Island is equipt with a butcher block top and a drawer designed to store your knives. Classic and beautiful, this kitchen island has a number of features that make for the ultimate kitchen island. Reach into your knife drawer and chop your favorite cheeses on the butcher block top. Enjoy slices of cheese with your favorite wine that can also be stored in this classic kitchen island along with the wine glasses. Storage doors and drawers are also available to store other kitchen essentials for a great night of relaxation. Choose from a variety of Butcher Blocks for the top with a clear finish or an oil finish top. Please call to receive finish samples. Light Distressing - Customers can expect to receive glazing to replicate a rich natural patina, light distressing, slightly eased edges, nicks and extensive pinholes in the furniture. Heavy Distressing - Our ultimate antique finish. Rub-through of the rich patina are masterfully punctuated with another level of extensive nicks, pinholes, eased edges, simulated cracks and other distressing techniques to bespeak several centuries of robust wear and loving care. Shown in Rustic Hickory Base in Medium Cherry with a Maple Top with Oil Finish.